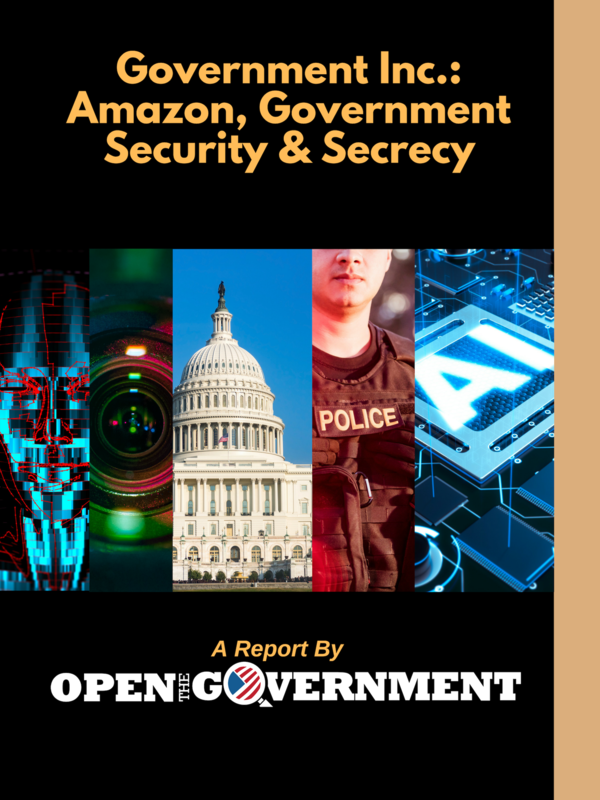 Washington, D.C. – Open the Government’s new report ‘Government Inc.: Amazon, Government Security & Secrecy’ is an in-depth study of government technology contractors, many household names such as Amazon, that supply expansive tools and services behind immigration enforcement, policing, surveillance and national security. Yet their work on behalf of the U.S. government is often highly secretive, allowing the companies to escape public scrutiny. Amazon quickly emerged as a case study for the report because of its increasing lack of transparency and failure to provide the public with information about its government contracts, compounding concerns about the secrecy surrounding its controversial technologies for government agencies, such as its facial recognition software, which studies have shown is prone to bias and inaccuracies. In the past several years, Amazon’s lack of transparency appears to be inversely proportional to the exponential increase of its lobbying expenditures for even more government contracts. The company is the frontrunner for the Pentagon’s unprecedented $10 billion, 10-year Joint Enterprise Defense Infrastructure (JEDI) program, and is poised to secure dominance in cloud-related government contracts in the years to come. In the 50-page, three-part report, OTG examines the myriad ways U.S. government security runs on Amazon. The Department of Homeland Security relies on Amazon’s cloud services for its information sharing, border security and immigration enforcement operations. The FBI has piloted Amazon’s controversial facial recognition software, police use it for surveillance and the technology has been pitched to Immigration and Customs Enforcement. The report offers recommendations to federal, state and local governments, and to the private sector, to ensure rigorous transparency and accountability rules are in place when private actors perform government operations. Sponsored by the American Society of News Editors and Reporters Committee for Freedom of the Press, Sunshine Week will take place March 10 to March 16 throughout Washington, D.C. and across the country.